Positive mean change of ‘2.85%’ in the stock value of 13 leading IT companies is a good indication, shown at the NYSE and around the Globe stock exchanges, on the opening day of first full week of Year 2014. The question is; is it reflecting the effects of International CES 2014, scheduled to be held during January 7-10, 2014 at Las Vegas, Nevada. The 13 leading IT companies, stock of which increased on January 6, 2014 are: Alcatel, Apple, BlackBerry, Facebook, Gigabyte, Google, Huawei, LG, OANTECH, Sony, T-Mobile, Vodafone and ZTE. The stock of the companies which fell on January 6, 2014 are; Hewlett-Packard, HTC, Microsoft, Motorola, Nokia, Oracle, and Toshiba. Highest change of ‘39.29%’in the stock of ZTE was noted on January 6, 2014 followed by that of BlackBerry. 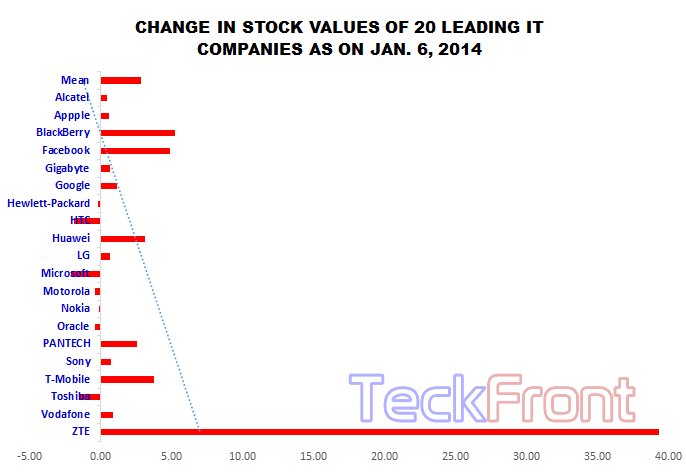 Highest reduction in the value of stock was observed in the stock of Microsoft which is ‘-2.11%’. I am analyzing the effects of CES 2014 on stock of 20+ leading companies and will continue to inform you about the effects of CES 2014. Newer Alan Mulallay’s Refusal to Lead Microsoft, Led MSFT to Red Day?